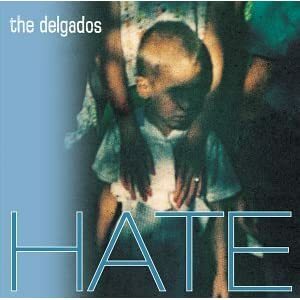 The Delgados kind of flew under the radar of most folks during their heyday. It’s a shame because they continuously progressed and evolved during their eight-year career into something truly special. Not only did they start their own influential record label, Chemikal Underground, which spawned the careers of Mogwai and Arab Strap, but they quietly released some of the most gorgeously bruised and bittersweet albums of the era. Between Peloton, The Great Eastern and Hate, this Scottish band recorded a trio of albums that will hopefully get the attention they deserve someday. The band was blessed with a knack for well-written odes to disappointment and despair and the tandem of vocalists Alun Woodward and Emma Pollock allowed the band to alternate between her stately and elegant singing and his more resigned and beaten tones. Ironically, as their music grew more orchestrated and gorgeous, their subject material and instrumental palette consisted solely of shades of grey. No one wins in these songs. No one finds true love. Everyone just drinks a bit too much and fixates on their flaws while pointing out the imperfections of others and how they let them down over and over again. Hate sounds like a swan song and it probably should’ve been considering its followup Universal Audio was a shadow of what came before. There is nothing cheeky or ironic about the album title because it kind of sums up the tone of the lyrics and weary, late-night ambiance of a prickly album about the failings of the world and those who live on its accursed surface. It’s kind of odd that they aligned themselves with producer Dave Fridmann who is most famous for crafting kaleidoscopic orchestrations that are more style than substance. Best known for his work with Mercury Rev, Flaming Lips and MGMT, his work tends to be gorgeous at first glance, but as satisfying as an aesthetically pleasing confection that leaves you wanting soon after. However, his work on Hate and its predecessor The Great Eastern brings the band out of its cantankerous shell and coaxes plenty of bombast and drama to accompany the band’s predilection for delicate and dour slices of life. Hate is as bleak as its namesake. Here you’ll find explorations of a man’s last moments before he takes his life, the embrace of the last halcyon moments before the end of a relationship and a plea for all to accept the fact that everyone’s heart harbors hateful intentions. All of this vitriol and self-loathing is couched in lush arrangements and laced with catchy choruses to mask its true intent, but this album is misanthropic to its core and all the better for it. It is a brutally honest exploration of what lurks behind our smiles and exposes the grim motivations behind our weaker moments. Hate is a walking contradiction that marries the most resplendent and ostentatious arrangements married to the most calamitous and desolate worldview and this conflict is the the source of its staying power and gravitas.